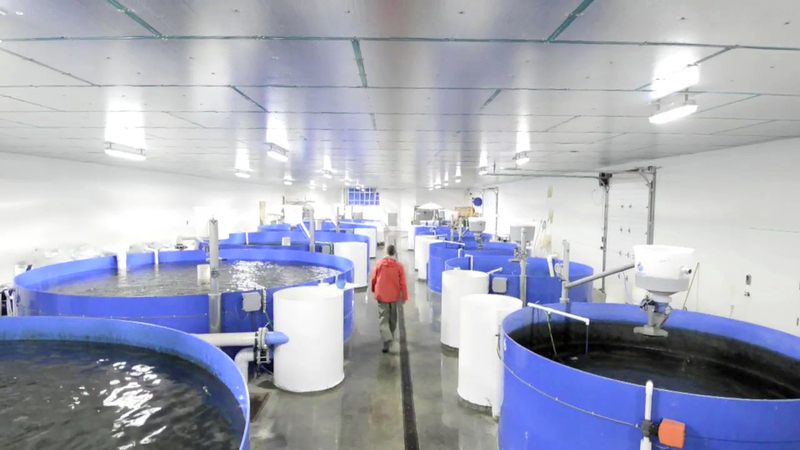 The aquaculture facility is housed in an 8000 sq. ft. concrete building giving complete control of the environment. The foundation of the farm is we draw cold water from a pathogen free aquifer. Since we have a disease free environment, we operate without hormones, antibiotics, vaccines, or any medications. Our strongest treatment is salt water to help resist opportunistic disease. 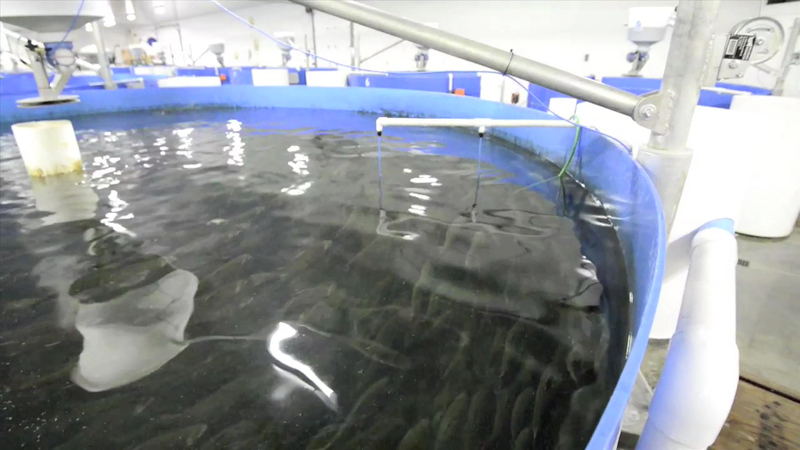 Fish are cultured in polypropylene tanks. Water retention time is one hour. Before it is discharged into the Okanagan River, water enters our state of the art, 450 cubic meter water cleaning plant. Our facility utilizes state of the art systems to insure consistent water quality and temperatures. Our electronic feeding system maintains near perfect distribution and portioning. We employ custom electronic systems to control CO2 levels and maintain oxygen within precise parameters. Dozens of water conditions are monitored and alarms alert us of any conditions that could jeopardize fish health. Our “Barn” has been designed from the onset to employ state-of-the-art processes, providing an optimum environment for our fish. An 80 feet deep aquifer supplies proven disease-free 12*C water. From the well, water is filtered through a tower that stripes it of CO2 and boosts oxygen saturation. State-of-the-art oxygen generation and injection equipment maintain oxygen at premium levels for the fish. The water is routinely monitored for temperature, oxygen, ammonia, PH levels, and flow. Water flows through the tanks, utilizing a dual drain system separating solids from the clean water prior to a settlement process. Each tank employs a swirl separator constantly trapping solids, which are flushed to a solids compartment daily. Water then flows over settlement pyramids where solids settle and are removed to the solids compartment biweekly. The water continues into a large center holding tank where the remaining suspended solids slowly settle and are moved to solids chamber yearly. Finally, the water passes through a drum filter with a membrane of 54 microns in an ongoing mechanically filtering process. The small amount of remaining solids is also pumped to the solids compartment. All solids are composted and sold as organic fertilizer. Tanks are located in a contained building where no pets, rodents, birds, other vertebrates, and insects have access. The premises are code-locked to control entrance and all staff are required to wear provided sanitary footwear while in the barn. Antibacterial footbaths are located at all entrances. Biosecurity is maintained after obtaining healthy stock and optimizing their health and immunity through good husbandry and health management plans. Eggs are purchased from a broodstock farm with a DFO health certification. Since we have a disease-free environment, we operate chemical-free. While the eggs hatch in 7*C flowing water, meticulous care is taken to keep shells and culls picked and trays clean. As the hatchlings grow, they are sorted by size to gain optimum feed consumption. 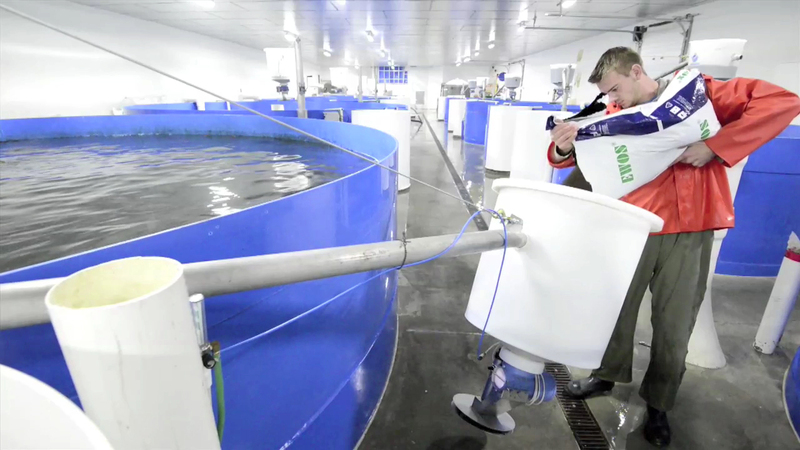 Record keeping plays an important role in fish health and farm profitability. Feed consumption, water tests, mortality count, and fish biomass are carefully recorded enabling a maintained consistent environment.